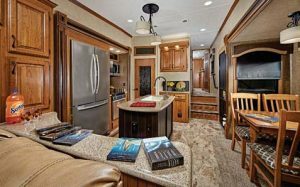 RV enthusiasts and families new to the RV lifestyle are in for a treat as the 2016 models appear at RV shows across the country. 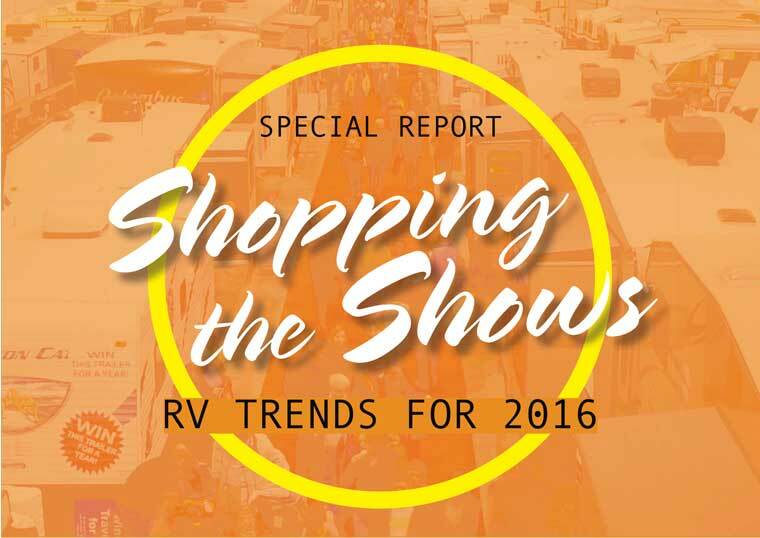 The RV industry has enjoyed two years of strong sales in the United States, which has enabled manufacturers to incorporate a wide range of new technology into the new units. The quest for lighter, stronger and more affordable RV models has prompted engineers to rethink the materials and construction methods used in many of the units, making the class of 2016 the most advanced models ever produced – at very reason-able prices. We gathered our RV Lifestyle Road Test Teams to compile a special report on the new models and the trends to look for as you shop the Canadian RV Shows. Large fifth wheel trailers like this Starcaft FW377RDE include residential appliances and state-of-the-art lighting and electronics. The RV market is segmented into five basic categories – towable trailers, motorhomes, truck campers, toy haulers and park models. 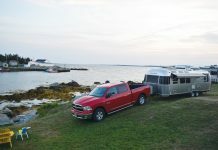 Within the towable category there are two sub-categories: travel trailers, designed to be towed by cars, light trucks, vans and SUVs, and fifth wheel trailers designed to be towed by pickup trucks. 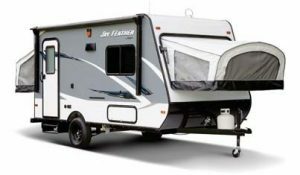 The motorized segment includes three sub-categories: class A models built as a single unit on specially designed bus-type chassis; class B models engineered to transform full size van chassis into fully equipped recreational vehicles; and class C models that combine the automotive cab and chassis of a van with the RV components of a travel trailer. 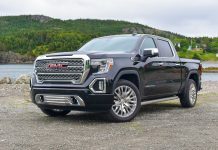 The toy hauler segment includes towable and motorized models, and it is expanding at a very rapid pace – but we still group the units as a single category, although this will no doubt expand in coming years. 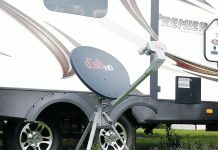 All of the RV segments have benefited from advances in the consumer electronics field, with a full range of enhancements to the entertainment options in the units. LCD TVs are appearing as standard or optional equipment, stereos are more sophisticated than ever before, and many RV models have special apps that enable you to control and monitor systems from your smart phone. On the RV engineering and construction side, advances in manufacturing and materials have made the vehicles more colourful, more durable, and lighter – all promising to increase long term viability of the vehicle and enhance resale values. 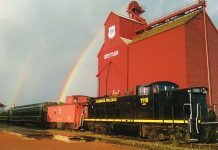 The most notable advances have come in the redesign of key chassis components like slide-out systems, entry stairs, and pull-out cargo access systems. 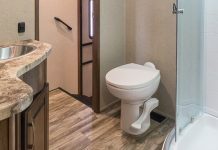 The 2016 class A motorhomes are sporting larger slide-out sections, thanks to advances in construction materials and slide mechanisms. Engines are slightly more fuel efficient and emissions are cleaner as all of the chassis manufacturers aim for their clean air goals. Many of the class A motorhome chassis now feature electronic dash components which enhance daylight visibility. In the class B sector, dominated by three Canadian manufacturers (Leisure Travel Vans, Pleasure-Way, and RoadTrek) the big news is the use of two of the industry’s best platforms – the Ram ProMaster chassis and the Mercedes Benz 3500 Sprinter chassis, both running cleaner and more efficiently this year. 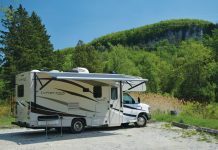 Class C motorhomes have been making a bit of a comeback in recent years, especially in the toy hauler role, where advances in rear loading ramp design and technology have substantially enhanced the popularity of the vehicles, especially when the ramp can also be used as a rear patio. The most exciting sectors of the towable RV category for 2016 are the light-weight and ultra lightweight models, and the larger travel trailers and fifth wheels, with both ends of the spectrum benefiting from lighter materials and components. 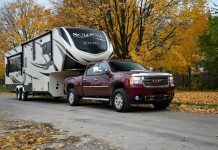 The bottom line for RV enthusiasts is that you can enjoy larger models at the same or lighter weight than earlier designs, or take advantage of the lighter load to save money at the fuel pump. 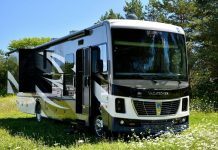 RV enthusiasts who prefer to stay in one RV resort location for an extended period will be delighted with the new wave of park models for 2016. 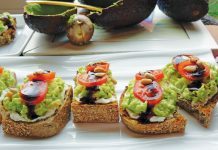 Manufacturers have incorporated the latest in residential appliances and appointments to create RV residences that truly rival cottages in every respect except cost. 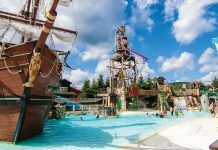 From single-wide units to double-wides, the décor, interior and exterior designs are spectacular, ranging from rustic to ultra modern units spanning a wide price range. 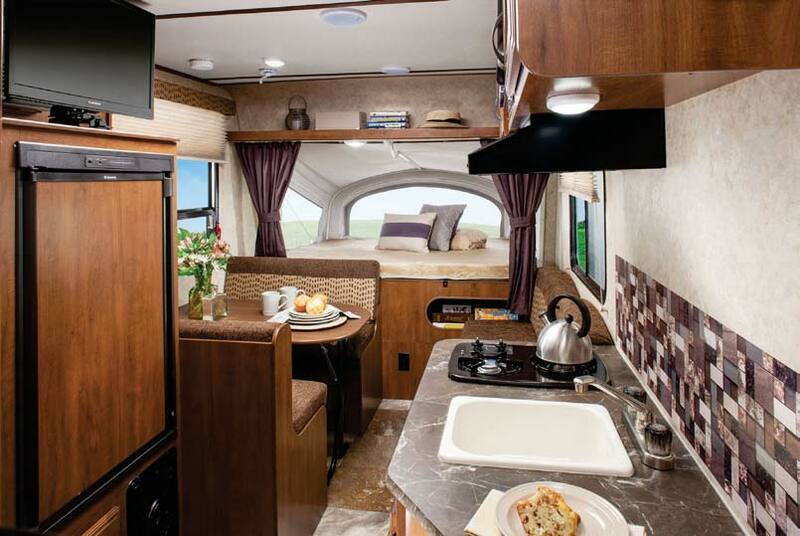 Hybrid travel trailers like the Jay Feather 16XRB have beds that extend from the front and back walls to expand your interior living space. 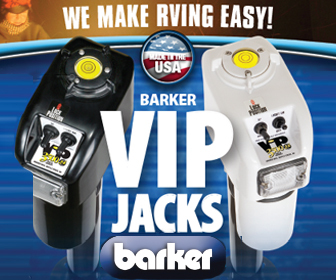 Many RV shows feature an on-site parts and accessory store. 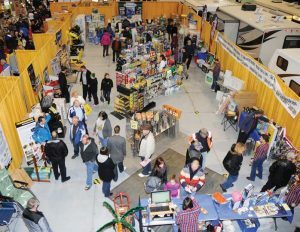 Many RV buyers visit the RV Shows with only a vague idea of what may be available to suit their family’s needs and budget. In some cases, they choose units that are either too large or too small for their needs. 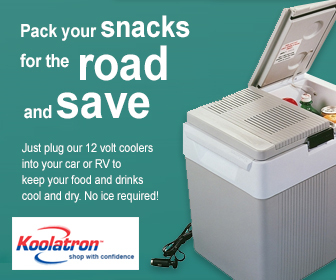 Over the years, our Road Test Teams have found that the best approach to selecting an RV is to start by looking at a variety of models – towable or motorized, that seem to be appropriate, and plan to spend at least ten minutes inside each of the units. 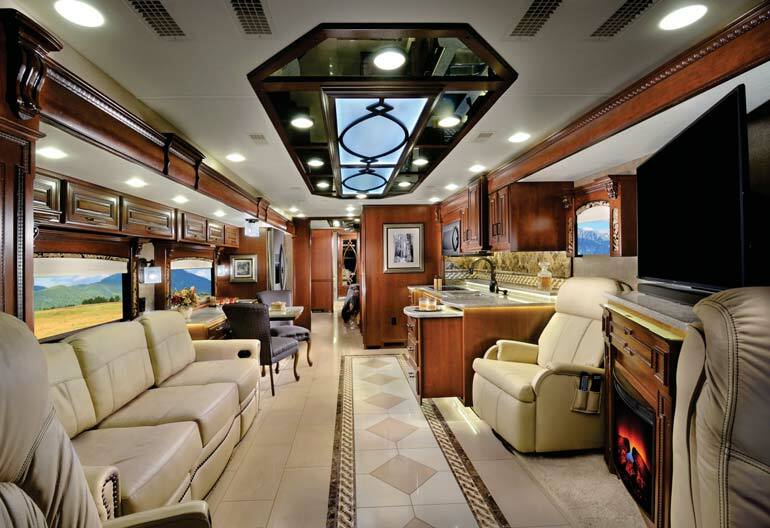 Sit down in the dinette and look at the floor plan – imagine spending a full day in the vehicle during a rain-storm – is there enough space to give every member of the family a “comfort zone”? Are the RV appliances in the galley conveniently placed – can you reach the various cupboards and storage compartments? 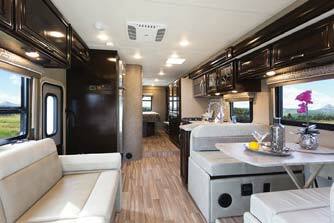 Does the RV have the flair that matches your lifestyle? Once you have narrowed the selection to a specific type and size of RV, it is time to let your local dealer help you fine-tune the process. 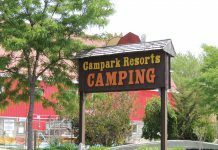 Your RV dealer has years of experience to share with you, and their goal is to have as many happy customers as possible… buying an RV is not like buying a car – this is a purchase that has to please the entire family, and if you choose wisely, your RV could be your campground castle for a generation. 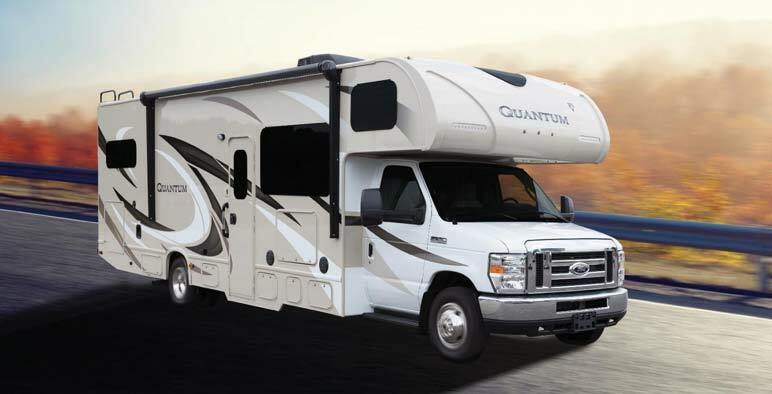 For compact mobility, class C motorhomes like this Quantum WS31 model from Thor Motor Coach provide all the comforts of home at a realistic price point. 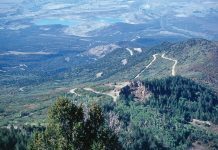 There are several websites where you can locate an RV dealer in your area. 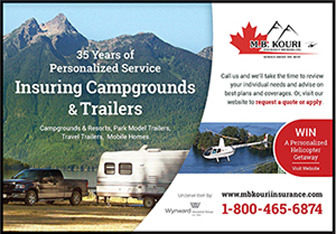 Start with the Go RVing Canada site at www.gorving.ca and take a look at a compendium of information on choosing an RV, then click on the “RV Dealers” link at the top of the page to locate an RV dealer in your area. 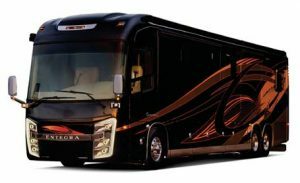 Check out our RV Lifestyle Magazine website for links to a wealth of information, and our archive of back issues – follow the link to www.rvlifemag.com . How I Convinced My Wife She Didn’t Need an SUV.